Glaramara at 783 metres (2,569 feet) is central and part of a long ridge that stretches over 3.75 miles (6km) from Stonethwaite in Borrowdale up to the mountain pass of Esk Hause. Glaramara has two summits and separates the valleys of Langstrath to the east and Grains Gill to the west. The ridge has two additional fells, numerous subsidiary tops and several small tarns. Combe Gill on its northern flanks is a good example of a hanging valley formed by glacial erosion during the last ice age. The gill is full of crags and according to Alfred Wainwright contains a natural cave called Dove Nest Caves. A rock slip from Dove Nest Crags has partly covered the cave which has three entrances. Glaramara’s east and west slopes fall away steeply with rocky slopes and scree to the valleys. To the south the ridge continues from the summit for 1.25 miles (2km) over three subsidiary tops, without losing too much height, to Allan Crags before descending to Esk Hause. The tops with Hewitt or Nuttall status are named Looking Steads, Glaramara South Top / Red Beck Top / Lincomb Head, and lastly High House Tarn Top. 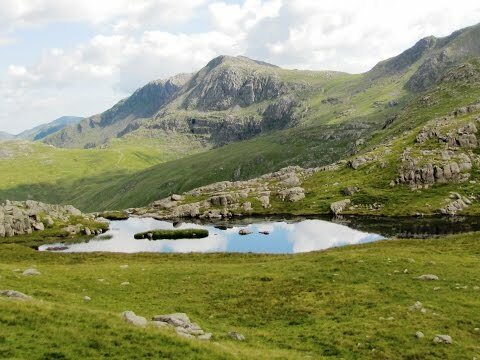 The annual Glaramara Fell Race, a five mile race with 640 metres of ascent from Glaramara Outdoor Centre near Seatoller to its summit, takes place in July. With Glaramara being situated in the centre of the Lake District the views from the summit give a good all round panorama. Allen Crags situated at the end of the long ridge from Stonethwaite to Esk Hause stands at 785 metres just two metres higher than Glaramara. The fell is craggy and rocky and falls away steeply to the head of the Langstrath valley on its eastern side. Its western side, of grey slabs of rock, is not as sheer as it falls away to Grains Gill a lovely little valley separating Seathwaite Fell and Allen Crags. To the south the fell drops more gently to Esk Hause. The summit of Allen Crags, seldom climbed as a sole fell, has three cairns with the middle one set on rocks being the highest. It has a great view of Great Gable and a wonderful northern panorama from west to east whilst the southern view is restricted by higher fells. Glaramara, Allen Crags and Seathwaite Fell are part of the 9 mile horseshoe walk from Seathwaite. We park at the side of the road and walk through the farm. We then go through the gate and head forwards following the track with the stream on our left. We cross over the stream and keep heading forwards through a second gate. Just before a bridge we turn left through the gate, marked by a yellow arrow, into a field. We cross over Hind Gill and follow it steeply uphill to a wall. We go through the gate and keep following the gill on our left steeply uphill. The rocky path starts to bear right away from the gill and we keep heading uphill. As we come over the brow the path becomes grassy and faint but we keep following the cairns uphill to the large cairn on the sky line. The cairns seem to disappear but we keep heading forward uphill until we come to level ground. We now bear right and head forwards towards a cairn and the summit of Glaramara we can see in front of us. We make our way down and head for the next hill slightly to the right. We keep following the path over two more hills then make our way steeply uphill to the summit of Allen Crags. At the top we can see a cross shaped shelter at Esk Hause down below and head towards it. Just before the shelter we take the path going off to the right. We follow the path more or less on the level for about five minutes or so to where the path splits. We take the path on the right downhill past a steep gill on our left. We keep following the path and cross over a little footbridge Grains Gill is on our right. We follow the stepped path downhill, quite steep in places, to cross over Stockley Bridge and turn left. We now just follow the track with the gill on our left back to the farm and our parked car. This is hard walk on paths and tracks with steep inclines and declines. It is rough and rocky in places. Approx 6 miles allow at least 4 hours using OS Explorer Map OL4 and OL6, The English Lakes North Western area and South Western area. Start point: Seathwaite in the Borrowdale valley. Seathwaite is in Borrowdale in the Lake District, Cumbria. From the A66 coming from the east take the A5271 for Keswick. At the junction turn right. At the traffic lights carry on forward. At the mini roundabout turn left then left again at the junction. At the roundabout go straight over then at the next roundabout turn right and follow this road, the B5289, passing Derwent Water and Grange on the right. Continue on through Rosthwaite and after passing the left turn for Stonethwaite continue for a little further and take the next left on a bend in the road for Seathwaite. Follow this narrow little road to the end and the farm. Parking: At the side of the road near the farm at Seathwaite. There are no public toilets or refreshments. The nearest amenities are at Rosthwaite where there are public toilets just next to the car park and for refreshments there is the Royal Oak pub on the main road and the Flock-in Tearoom at Yew Tree Farm.